In the year 361, when Augustine was seven, there the Emperor Julian came to power remembered by history as the Apostate. In his attempt to re-establish the Empire, he tried to impose classical Roman customs. Without persecuting Christianity, he proclaimed many laws in favour of Paganism, with education being one of the areas most effected. In Madura, the city where Augustine continued his studies once he finished those in Thagaste, this pagan influence would be important as this city had strayed far away from the Christian influence. In Thagaste the pagan celebrations were sumptuous and shameful with the continuous rejection of Christian values in ironic fashion. In Carthage itself, the capital of North Africa, they acquired notable importance for their feasts to the Goddess of fertility, Celestine, with celebrations of sacred prostitution. They also revitalized the circus, the amphitheatre, and all manner of pagan spectacle where it was very common the rejection of Christian principles and the excitation of human passions from violence up to uninhibited sexual displays. As a Bishop Augustine will have to live in the middle of this atmosphere, and defend with artistry and eloquence Christian values. 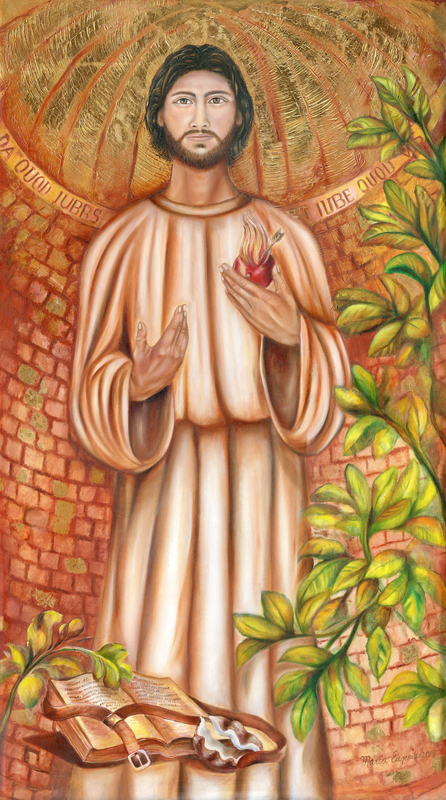 Saint Augustine, by Maria Eugenia Gutiérrez. Pozos de Santa Ana, San José, Costa Rica.